If you are dealing a lot with larger LCD monitor screen in extended mode (extended from your laptop internal screen), you may have experienced inconveniences when your mouse can easily cross over to other screen unintentionally. And in order to avoid such trouble, here is a tiny utility that you can try with ability to block those crossovers as desired, while still able to activate it back depending on users’ predefined conditions. Once download and install the utility, just launch it and you are ready to go. First, users can configure the defaulted profile named as ‘Global’ or add in new profile settings so that the Mousenitor can be turned on/off when specific profile is selected. Even though it may restrict the unintentional mouse cursor move but when users intend to move the mouse cursor to another monitor, there are some hot keys that can be defined to perform such action. 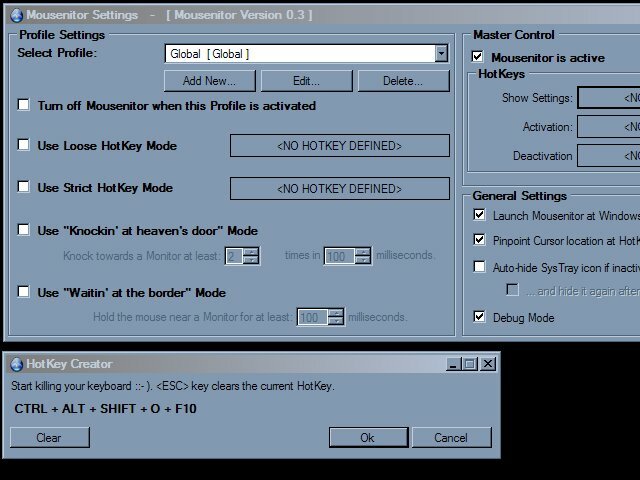 Besides, a specific act such as knocking towards the monitor with at least ‘N’ number in miliseconds interval or sliding the mouse cursors along the monitor border will able to deactivate the Mousenitor setting temporarily, allowing crossover from internal to external screen or vice versa as intended. Mousenitor is an open source utility and consumes less than 200kB of your hard disk space, it is free for download at Sourceforge but donation is always welcome to keep up the development effort.